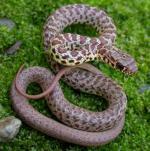 A small (up to 380 mm or 15" in total length), relatively stout-bodied, gray, yellow-brown, or tan colored snake with more than 25 dark gray or brown, zigzag shaped bars across the back. A small (up to about 600 mm or 23" in total length) gray, or orange-tan snake with a row of small, dark, gray-brown blotches on the back (dorsal blotches). The dorsal blotches are usually in a single row but are sometimes offset at the midline of the back creating two rows of small, alternating blotches. A medium-sized (up to 1,088 mm or 43" in total length) light olive-green, tan, or yellow-green snake with a pale stripe down the middle of the back. An additional light stripe runs along each lower side on the third scale row (counting up from the belly). The Eastern Yellow-belly Racer is a slender snake. It is olive grey-green, with a yellow or whitish underside. There are no markings on the head or back. dorsal markings. The throat and neck are bright yellow and the chin and lips are yellow or white. Juveniles are tan or cream with brown or grey blotches, changing to the grey green as they mature. They are fast moving diurnal predators. There are several steps to dealing with snake problems: making your property less inviting to snakes; discouraging the presence of, or getting rid of, the rodents and other small animals they feed upon; and dealing with any snakes that are already there. Average adult size is 20-56 inches (50-142 cm). Adult color typically is slate gray, but many specimens are brownish-gray, bluish, or greenish. The chin and throat are white. The belly is grayish to uniform black. The body is slender and the scales are smooth, and there are 17 dorsal scale rows at midbody. The pupil is round. Juvenile color is gray with distinct reddish brown blotches fading into a solid-colored tail. commonly known as the southern black racer, is one of the more common subspecies of nonvenomous snakes in the Southeastern United States. The name priapus refers to the proximal spines of the hemipenes being much enlarged into basal hooks, which is characteristic of this subspecies. The Eastern Coachwhip is one of the largest native snakes in North America. Average adult size is 50-72 inches (127-182.8 cm), record is 102 inches (259 cm). Adults are long and slender, and typically have a black head and neck, which gradually fades to tan posteriorly. Grows to a maximum size of 136.7 centimetres (4.48 ft). Adults commonly grow to 120 cm (3.9 ft) in length. Specimens over 150 cm (4.9 ft) are infrequently encountered, while those over 180 cm (5.9 ft) are very rare. This is a medium to large (16" to 54") rattlesnake with dark blotches on a variety of base colors ranging from reddish, pink, yellow/green, light tan, to gray. The blotches usually become bands near the tail. According to Wright and Wright (1957), adults grow to an average length of 78-109 cm. Klauber (1997) reports the maximum length to be less at 1,032 mm, with the smallest gravid female measuring 701 mm. Grows to a maximum length of 750 mm. The smallest gravid female measured was 522 mm. The color pattern consists of a pinkish, pale brown, yellow-brown, straw-colored, reddish or yellow-brown ground color, overlaid with a series of brown elliptical or rectangular dorsal blotches. The Hopi Rattlesnake is the smallest subspecies of C. viridis. The color is variable and may be pink, gray or orange-brown in color, matching the soil and rock color of their natural range. The back has darker brown blotches. The eyes have vertical pupils, and the tail has a rattle made of keratin. Each time the snake sheds its skin, a new segment is added to the rattle.